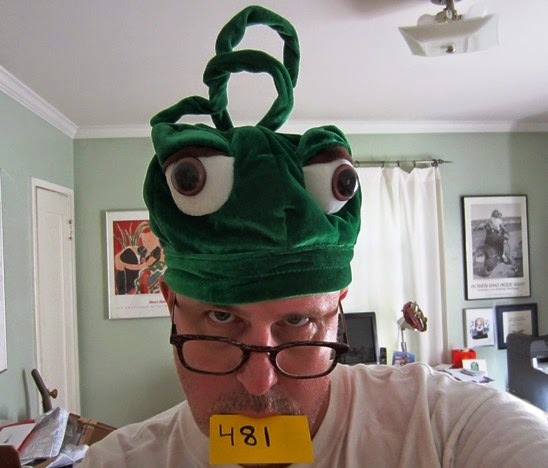 Obviously an entry that skews more toward the headgear than hat side of the equation, this thing gives me the serious willies. I swear I felt it getting ready to chomp on my brain even for the brief amount of time I was wearing it. The Bride snapped this critter up at the 19th Annual Southern Vermont Garlic & Herb Festival on the 30th of last month (the same day she purchased PC 461), and she intends to wear it while we dole out Halloween candy to the neighborhood kids this year. That's if it survives our two cats -- both of whom went into serious crouch mode the minute I donned the freak bonnet. 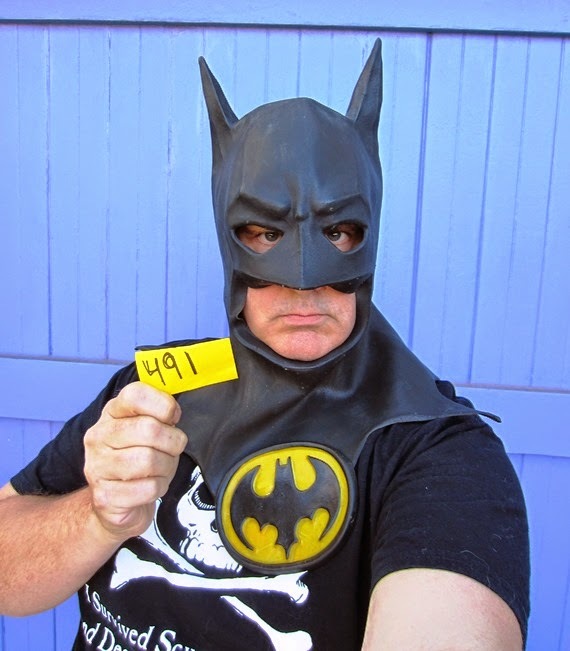 Day 491 / Hat 491: Black rubber Batman cowl with yellow and black oval-shaped Batman insignia on front and raised tone-on-tone lettering on back that reads: "TM and Copyright, DC Comics Inc. 1989, All rights reserved." Donning the bat cowl brought me much joy today -- for several reasons. First and foremost because it was part of the loaner pack sent by Bill Harrison via his son Zachary. Second, when I went over to pick it up from Zachary yesterday (a trip that also resulted in yesterday's "Fat Elvis" installment) I saw exactly how bat-smitten Zach really is -- his living room wall is covered in all manner of bat-merchandise depicting the Dark Knight in all his brooding glory. It was only after I left that I got thinking about how I had been given temporary custody of a cowl that, based on the date must have been merch flowing from the Tim Burton movie of more than two decades ago. Maybe I'm reading too much into it but I feel I was entrusted with a near sacred object. And finally, as I sat here this evening, brooding over plans for a new identity, a bat flew in the window and startled me. A hat-tip to the dynamic duo of Zachary and Bill. 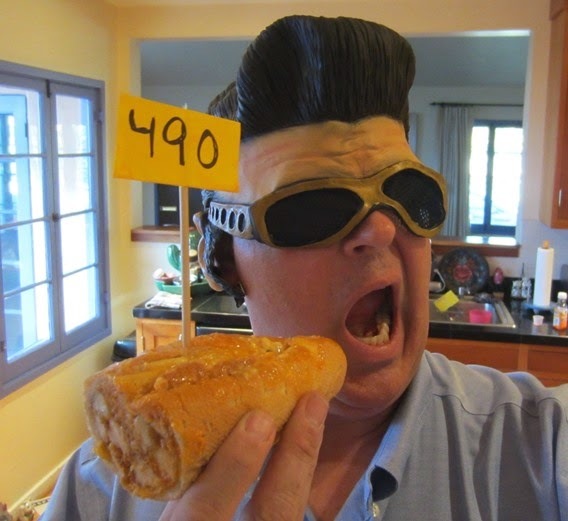 Day 490 / Hat 490: Molded rubbery Elvis headpiece including hair, forehead, ears, sideburns and gold-framed sunglasses with black mesh lenses. Loaned to the project by Zachary Harrison by way of his dad Bill Harrison or vice-versa (Bill sent the package, Zachary says they were sourced from his room back home in Ft. Wayne). Since I'm down to the last 10, I decided I'd try to have a little (more) fun, and when I headed over to Zachary's place to pick this piece of headgear (it's definitely headgear -- not hat -- and thanks to the ears and sunglasses it pushes beyond the sticky wig wicket) he happened to mention a new sandwich shop around the corner called Fat Sal's Deli - and one sandwich in particular that he had eaten there called the "Fat Buffalo." The Fat Buffalo, in case you were wondering (I know you were) consists of chicken fingers, mozzarella sticks, melted cheddar, french fries, buffalo hot sauce and blue cheese dressing made on an extra-wide hero roll. What you see in the above photo is the half a sandwich that survived the unwrapping process long enough to document. As I headed out the door to check out this place for myself, Zachary called out after me: "You know what would be funny? 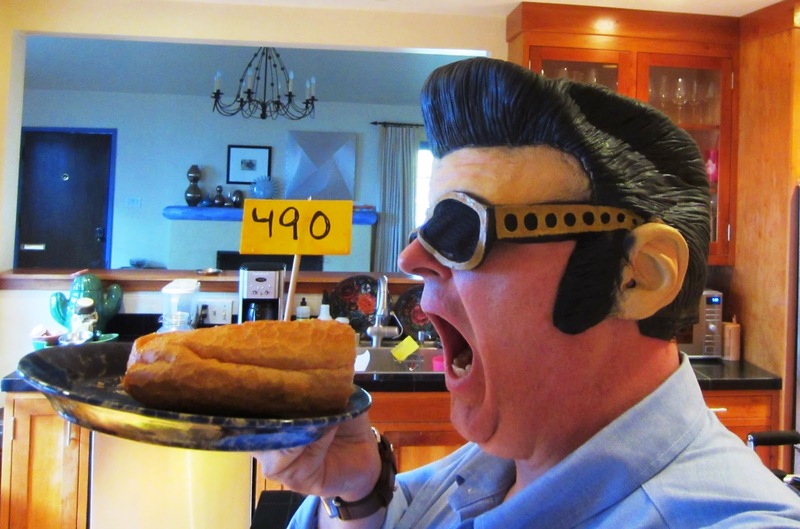 Eating a Fat Buffalo while wearing the Elvis!" A hat-tip to Bill for the sending the hat and the assist to Zachary for the photo suggestion. I need to go take a nap. 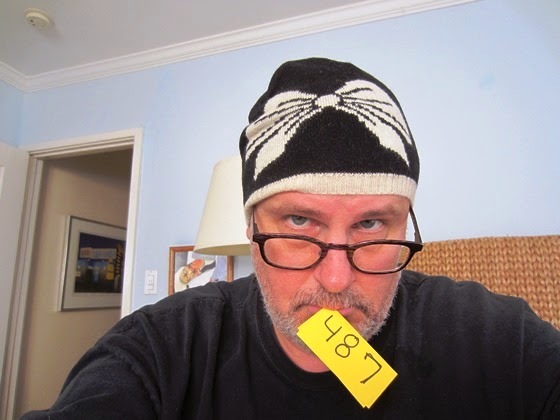 Day 489 / Hat 489: Knit, multi-colored, beanie-style cap with black pompom on top and black folded-up edge. Intarsia knit detail includes a row of green Christmas trees with red ornaments against a white background (toward the top), a row of white, stylized snowflakes against a red background (toward the rolled up edge at the bottom) and a row of smiling gingerbread men in gingerbread brown against a black background with green and red frosting detail. Hangtag reads: "Women's, one size, Fashion hats," and indicates the brand as Joe Boxer. A little sleuthing of the interwebs found it to be this "Joe Boxer Women's Ugly Sweater Hat -- Snowflake, Christmas tree & Gingerbread Men." At any rate, since Christmas always has a way of sneaking up on me, I figured turnabout was fair play for once. And, just in case you were wondering, we're just eighty-eight days out from Christmas 2014. Consider this a public service message. 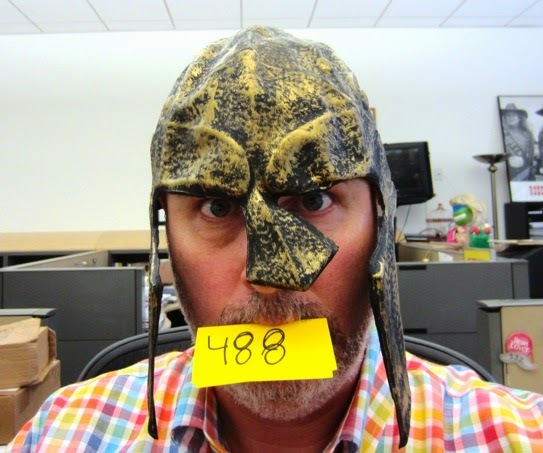 Day 488 / Hat 488: Plastic Spartan warrior helmet with gold and black hammered metal finish. Printing inside reads: "made in China." This helmet is part of California Costume Collections' "Spartan Warrior" costume ("The fiercest of all of Greece, the Spartan Warrior never retreats," reads the tagline) which was pulled at random from a large orange box that I found sitting at my desk upon my return from New York Fashion Week. Not the first piece of plastic armor to be featured mind you (that'd be PC 194), this is actually the look one tries to affect by donning the Miller Lite box headgear -- with the handle of the box approximating the look of the nose guard. This installment of the Project brings me down to the dirty dozen. I wish I could promise some fantastical pieces of Seussian headgear over the next 12 days but given my inability to plan I'm improvising every last hat all the way to the end. But the hat gods have always smiled upon me in my time of need and I have no doubt that they will continue to do so until I've thrown my very last hat in the ring. Day 487 / Hat 487: Black, knit, four-panel, beanie-style cap with white intarsia knit bow in front and white edge detail. Interior tag reads: "Aqua, made in China," on one side and "100% wool, hand wash warm, RN 66349," on the other. She's currently far afield so I can't ask her about the provenance of the hat but I think that my original assumption that it was vintage is off base given the product number on the tag and the fact that Aqua is a brand that crops up quite readily on the interwebs with hats available for purchase. I like to think of this as one of those visual play on words -- the Bride's beau in a bow. 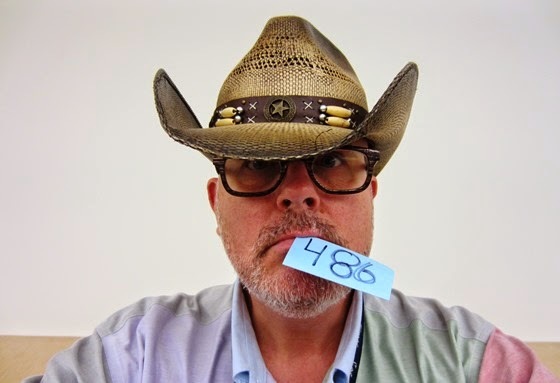 Day 486 / Hat 486: Woven straw western-style hat with brown faux wear/weathered finish and faux leather hatband detail with X-stitching, bone beads and a metal, five-pointed star. Interior details include label, crown sticker and sweatband lining emblazoned with the words "Run A Muck collection." Also on the crown sticker are the words: "Bullhide by Montecarlo Hat Co." Tag inside identifies the style as: "Desperado (Brown), Item 2709." 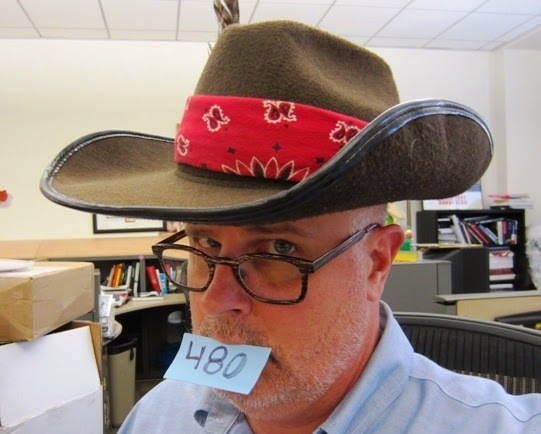 Loaned to the Project by Anne Harnagel who tells me -- with unerring specificity -- that this hat was purchased by/for her son (he of PC 480 fame) at an establishment called Duke's Clothing in Kanab, Utah. And, just so there's no confusion, "Running A Muck" may be how they're spelling this hat style, but when one is referring to a sudden outburst of wilding and violent behavior it's "running amok." Also learned with this hat entry? The fact that "amok" is actually a listed disorder listed in the DSM-IV. Day 485 / Hat 485: Folded paper pirate hat printed in black with black and white printed cord detailing around top and sides. Additional detail includes oval in center that reads: "Pirate's Dinner Adventure, Buena Park, California" accompanied by the phone number and website address of said dinner adventure. I've had this piece of piratical ephemera kicking around the Garlodge for several years now (I'm going to guess at least five), a souvenir from a Pirate Season birthday-tide voyage behind the Orange Curtain organized by my sister-in-law 'Thleen and involving several friends and co-workers. Those memories are hazy and every time I play them forward and back in my head I feel a little bit more of them disappear forever like a slowly demagnetizing VHS tape. If I recall correctly there are a few photos out there (and at least one piece of video) that captured the assorted buckling of swash and hauling of keel. I really ought to try to locate them. Or maybe I'm just looking at it through the wrong eye patch. Perhaps Pirate dangles that apostrophe out there as a kind of scar or a badge of [dis]honor to strike fear into the hearts of grammarians everywhere. 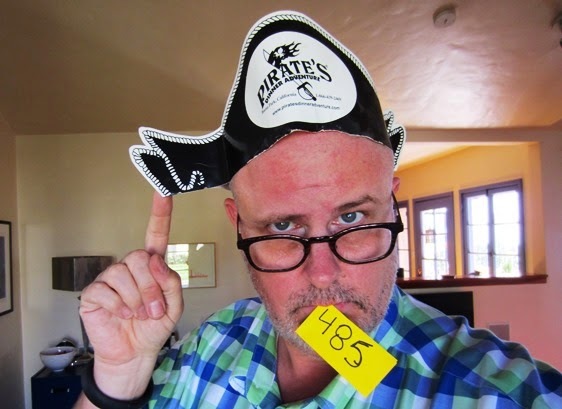 If that interpretation turned out to be true, it would make me one very jolly roger indeed. Day 484 / Hat 484: Child-sized woven fedora with brown and tan grosgrain hatband detail. interior label gives the fabrication of said fedora as 80% paper and 20% acrylic, puts the size at 54 cm and lists the country of origin as China. Despite its genesis in the Far East, to me this hat will always be about the Dutch -- for two reasons. 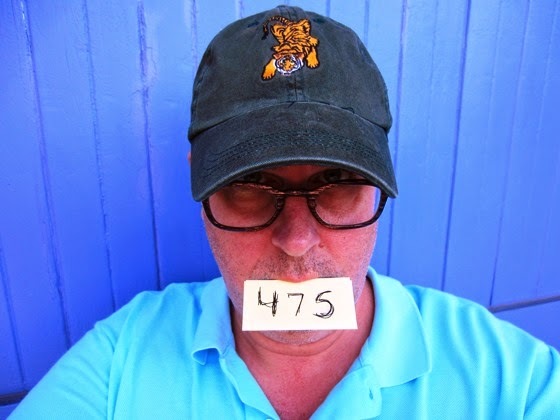 Chiefly that the hat was purchased back in January at Flicka (on Larchmont Blvd.) as a possible accessory for a children's "Dutch Masters" photo shoot for George (George is the Bride's godson, the purchaser of the hat was his mother) at his preschool. themed photo shoot. But the school's loss was my gain (the photos in the resulting book were hilarious by the way) as I got a chance to wear George's rejected fedora atop my own head. The second reason (I said "two reasons," remember?) is that, as of this writing, the Bride is winging her way to Paris via Amsterdam. After her Air France flight was canceled (due to a strike) she was rebooked on KLM. After some minor friction with her seatmates, she and the Flying Dutchmen are headed east. With any luck they're all currently sawing the Dutch equivalent of logs. A hat-tip to Heather, an assist to young master George, and a polite, cursory nod to the Dutch. 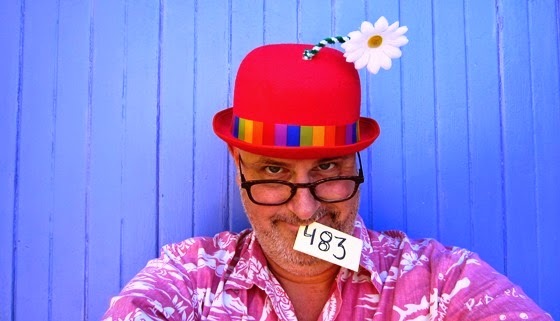 Day 483 / Hat 483: Red felt bowler with rainbow hatband detail and fabric daisy with green-and-white-striped fuzzy pipe cleaner stem sprouting from top of crown. The second of two hats loaned to the Project by Amy Novak and her daughter (the first was PC 481) and Amy say this was sent to girl child as a "an early birthday present from her grandparents." Which makes it a more than appropriate hat to close out one of my own years and welcome another. Here's hoping everything sprouts as joyfully as a cartoon daisy in the year ahead! A sincere hat-tip to Amy and daughter. Thanks for the loan - your hats will be enroute back to you shortly. 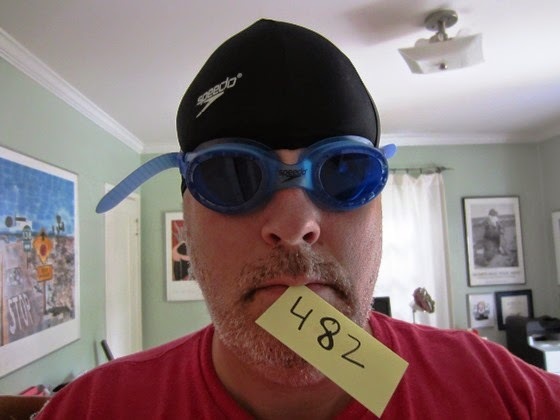 Day 482 / Hat 482: Black fabric three-panel swim cap with Speedo name and logo in white. Interior tag reads: "Speedo, RN#54934, 82% nylon, 18% Lycra Elastane." Reverse side of tag hincludes som trademark-related gibbersih and "Speedo America, a division of Warnaco Swimwear Inc., made in China." I did not choose this wholly at random either as the last few days have left me feeling very out-to-sea / underwater / in-over-my-head /stuck in the deep end of a very deep pool. I know in my heart of hearts that if I can keep my head in this game for 500 consecutive days - as it appears at this point that I almost certainly will - there's no reason why I can't buckle down and tackle the rest with a similar intestinal fortitude. Day 480/ Hat 480: Brown felt cowboy hat with upturned four-inch brim and a five-inch creased crown. Additional detail includes aftermarket red bandanna folded and tied around base of crown and a seven-inch-long species indeterminate feather tucked into the right side of the bandanna. Interior tag reads: "One sze fits most, spot clean only, RN #17730, made in China, Target, 06/13," which makes me think it was made for - and sold by -- Target roughly 15 months ago. Circle gets the square and Harnagel gets the hat-tip. With this hat in the bullpen I'm 480 down and 20 at-bats left -- how do you like that wranglin'? I'm ready to rope 'em, throw 'em, and brand 'em. 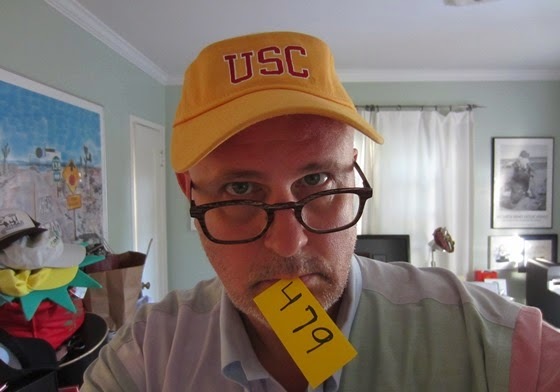 Day 479 / Hat 479: Gold-colored cotton visor with "USC" embroidered on front in cardinal red edged in white embroidery. Additional detail includes Velcro-closure adjustable strap with the word "Trojans" embroidered in all-capital letters over top and interior label that reads: "Heritage, 100% cotton, made in China." The final lid plucked from the recent Josie Witte BOH, is, indeed, a visor -- though from the angle of the photo it sure seems like a full-on hat. "USC’s official colors are Pantone 201C and Pantone 123C. These colors, designated as USC Cardinal and USC Gold, are equal in importance in identifying the university. All printed materials, whether printed on coated or uncoated stock, should match color to the coated Pantone chips." I think I'll take my coated (or uncoated) stock and call it a night -- with the final hat-tip and deep bow of gratitude to Josie. 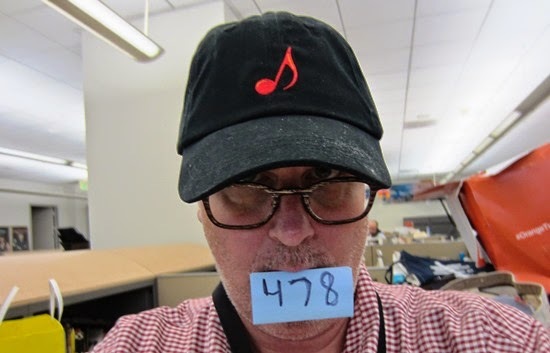 Day 478 / Hat 478: Black, baseball-style cap with adjustable Velcro closure in back and red (and a tiny bit of accent orange embroidery on front of a musical note. Additional embroidery on back reads: "Music City" in white script with same musical note (albeit in a much smaller size) between the two words in red embroidery. Interior label reads: "Otto Collection, 18-686, 100% cotton, one size fits most, made in China, RN129002." As I'm not musically inclined, I had to look up what kind of note it is -- based on my cursory search of the interwebs it is called an eighth note (in the U.S. and Canada) known as a "quaver" in other English-speaking countries. As the very definition of an eighth note is one held for one-eighth the duration of a whole note, dubbing this entry to the Project a "Short Eighth" might seem out of place. Not so! Ms. Short procured said lid during a recent business trip to Nashville, Tennessee, which, as I'm sure you're figuring out by now, goes by the nickname "Music City" (the city's nickname - not Alice's).She hand-delivered to my desk yesterday for inclusion in the Project. Which, therefore makes it a high note of sorts too. 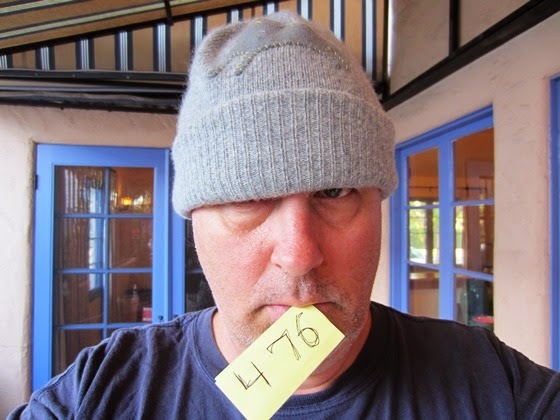 You see, over the past 477 hats I've had co-workers, loved ones and strangers hand me hats. 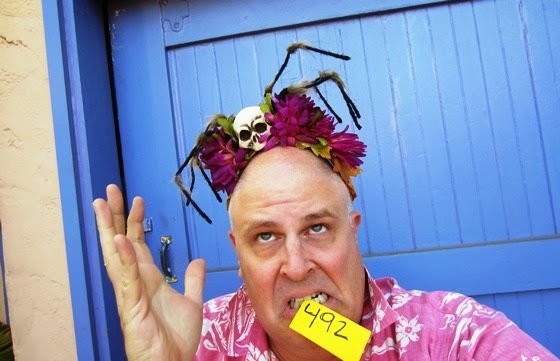 And, while my direct up-line bosses have clearly tolerated my enthusiastically Seussian side endeavour, I never thought in all my (nearly) 500 hats one of them would throw their hat in my ring. It goes without saying -- but I'll say it anyway - today's hat -tip goes to Alice Short. 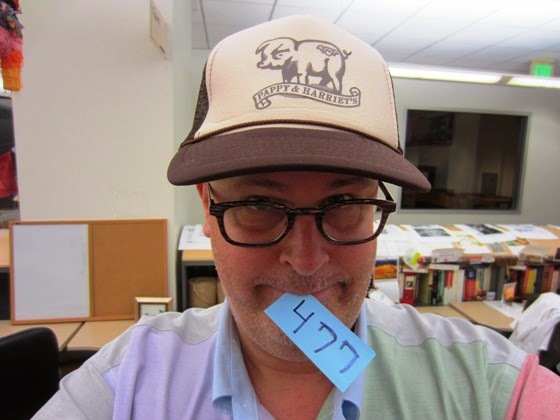 Day 477 / Hat 477: Trucker-style cap with brown mesh back and beige foam front with brown screen print on front of an adorable piglet with a tattoo of a winged heart on its left hindquarter that says"PH," all above a scroll-like banner that reads: "Pappy & Harriet's." Additional detail includes brown braided cord where brim meets crown. 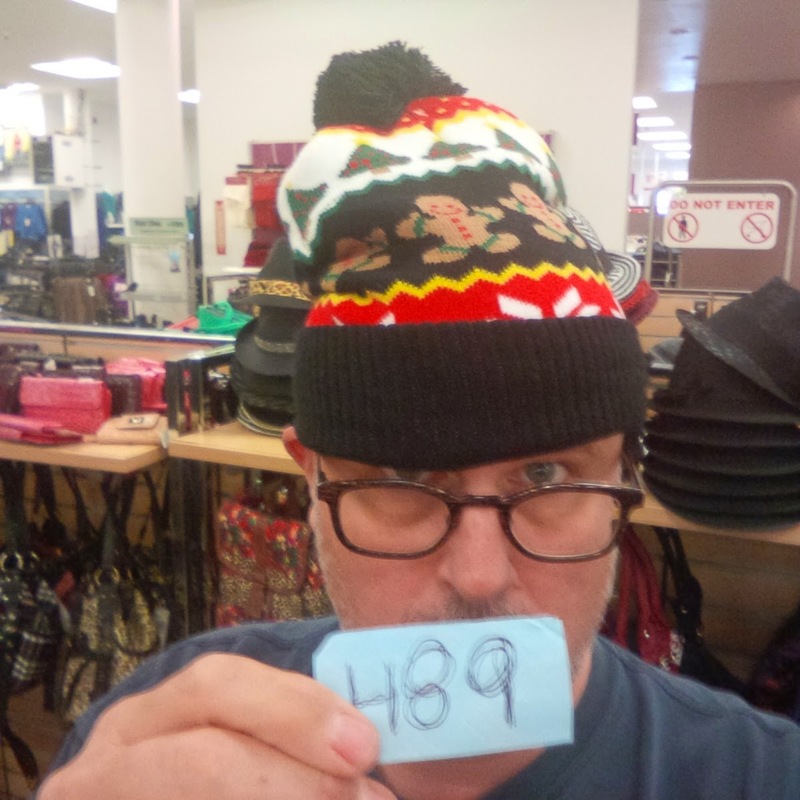 Interior label reads: "Otto Collection, 32-468, 100% polyester 100% nylon [which makes this hat 200%, apparently], one size fits most, made in China, RN129002." Pappy & Harriet's Pioneertown Palace is a honkytonk barbecue joint out near Joshua Tree National Park in a town called, you guessed it, Pioneertown. I've actually been there once but didn't walk away with a sweet lid like Noelle clearly did. She also walks away with today's unwitting hat-tip as I get back to the grind here in the Cube Farm. Day 476 / Hat 476: Gray knit beanie-style cap with gray stylized cat applique on front with yellow accent thread. Interior tag reads: "60% lambswool, 20% angora rabbit fur, 20% nylon, made in Philippines, dry clean only, RN 68299." Loaned to the Project by Josie Witte, if you ask me there's a while lot of animal representin' in that hat -- lambs, rabbits and kittens. Day 475 / Hat 475: Forest green buckle back baseball style cap with a crouching yellow, black and white tiger logo on back and the ords: "Davidoff Columbus Circle" on back in yellow embroidery. Interior label reads: "Alternative Apparel, 100% cotton, made in China." Loaned t the Project by Josie Witte, it was among those in a bag awaiting my return home from New York City. Which is ironic considering that, based on my sleuthing, it references a cigar club/store/lounge Davidoff of Geneva that is located in the shops at Columbus Circle -- right around where I was stomping my feet and hanging my many hats for the run of New York Fashion Week. What's a tiger got to do with cigar bars? It certainly makes one paws. (Sorry, I couldn't resist.) I couldn't find any information about that in my cursory search of the interwebs, but I did find a limited-edition Davidoff cigar humidor with a laser-etched tiger on the lid that refers to: "[t]he chosen image of the Tiger -- the symbol of strength and grace ..." So there's that. At any rate, the hat-tip to Josie for the smokin' lid. 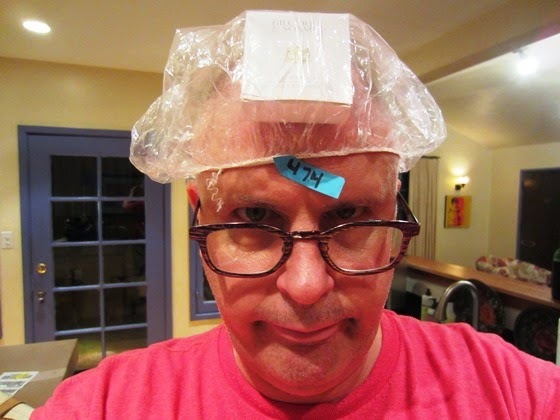 Day 474 / Hat 474: Transparent plastic shower cap with elasticized edge. Square box inside is an unopened Gilchrist & Soames shower cap (aka bonnet de douche). The idea for this installment of the Project began last night at the Dublin House, the local watering hole in our NYC Fashion Week neighborhood. The person suggesting it was Robert "Jigs" Janjigian (aka "Karen"),the fashion editor of the Palm Beach Daily News and, like the Bride and I, was holing up at the Lucerne Hotel during the bi-annual run of shows. He knew the "bonnet de douche" was one of the amenities offered by the Lucerne and, aware of the brisk schedule facing us in our return from NYC to LA today, thought it might be a good candidate for inclusion. Oddly enough, when we got to our room, there was a cookie delivery (unrelated to Jigs) hanging from our room's doorknob - in a plastic shower cap. That's why the box (Jig's idea) is tucked inside the serendipitous shower cap. Having arrived (finally) back in L.A., I offer the hat-tip to Jigs, the shoulder devil to my fashion week behavior.